This spring creativity is a differentiated hands-on activity that helps students learn about synonyms and antonyms. There are 5 words, each of which have 2 flowers (one for synonyms and one for antonyms), for a total of 10 flowers. Each flower has 6 petals with synonyms or antonyms for a total of 60 words (30 synonyms and 30 antonyms). Level 1 has the synonyms and antonyms printed on each petal. Level 2 has blank petals so that students can fill in their own synonyms and antonyms for each word. 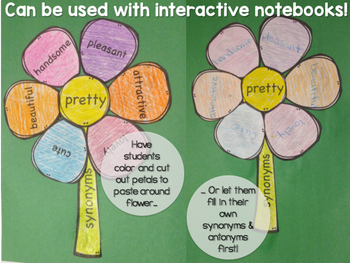 These flowers can be used in conjunction with Interactive Notebooks as a stand-alone ELA craftivity project or as a sort. 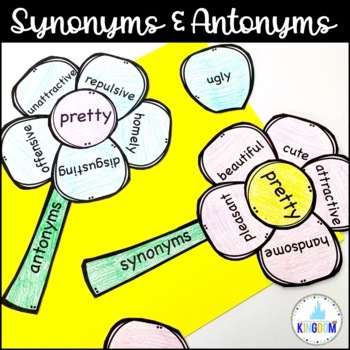 To use these as a sort, print out both synonym and antonym stems for a word and the pre-written synonym and antonym petals for the word. Mix them up and let your students sort out which petals go to which stem.